In my kitchen, I want to replace a regular 120V receptacle with a GFCI-protected receptacle. The instructions describe what to do with a regular 2-wire + ground feed, with and without daisy chaining to other receptacles, but not how to do it with a 3-wire + ground feed. Please describe how I should connect the new receptacle. I think it's connected this way so that each receptacle in the kitchen has their two sockets supplied by different breakers. At the service panel the circuit is controlled by a joined pair of 15A breakers. I assume the white and black are separate 15A lines and the red is a common neutral (?). Here are the instructions for connecting in a 2-wire scenario. How do I connect this? Or should I consult an electrician? The next problem. You'll have to pull new wire anyway, if you want to hook up GFCI receptacles. GFCI receptacles will not work properly with a shared neutral, you'll end up with nuisance tripping with a shared neutral. GFCI receptacles work by monitoring the balance between hot and neutral, so if the neutral is shared the GFCI will not work properly. To wire up the kitchen properly, you'll have to pull 2 new 12/2 cables from the breaker to the kitchen (all #14 wire on that circuit will have to be replaced). Then install 2 20Amp breakers, to supply the kitchen. You'll install the GFCI's as the first receptacle on each circuit, which will protect all downstream receptacles. You can share a neutral between 2 GFCI receptacles. The catch is you'll have to pigtail the neutral to the receptacles, not use the neutral from the load side of the first GFCI to feed the second. You'll then be able to use the load side of each receptacle to feed other devices, like this. Most of what Gregmac has said is correct, however I have to correct a couple of small items. It is totally acceptable and often done to use a three wire circuit (black/red hot, white neutral & bare ground) like you have to "alternate" kitchen receptacles, thus giving you two circuits. It is not a code requirement to split the top and bottom of the recpts, however it is fine to do that, but it complicates the GFI functions. 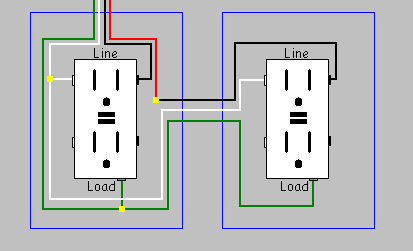 Splitting the top and bottom would require two GFI's upstream, one feeding each of the legs. More common would be two single pole GFI breakers in the panel. With that said, your situation is different. I bet you will find that the the black feeds every other recpt, and likewise the red does the same thing with alternate recpts. Once you confirm that, simply install a GFI on the first powered recpt of each string (color). As a matter of fact, this is the most common way kitchens are wired and meets NEC. I suspect that some writers are confusing the old Voltage Operated GFCIs with the new Current Operated GFCIs. The modern type contain a little toroidal transformer that the live and neutral are threaded through. Normally the go and return currents are equal so the transformer does nothing. If the currents are not equal the transformer produces voltage which operates the trip relay and cuts off the power. 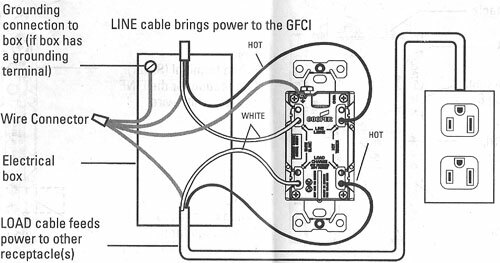 The old type of GFCI uses an earth rod. The house earth wires connect to one end of the trip-coil of the GFCI. The other end of the trip coil connects to the earth rod. If anything in the house leaks current the GFCI will turn off the power. The problem with this type of GFCI is that electrical storms can blow the trip coil. This leaves everything in the house un-earthed and with no GFCI. One delightful property that I was asked to "look at" was giving everyone electric shocks. The floors were concrete and the bungalow had a voltage operated GFCI with a blown coil. I suspected that the immersion heater element had also corroded and was now pumping current into the hot water system. Water taps, light switches, the kitchen range and anything metal that was supposed to be earthed were all live! The property was owned by a penniless widow and there was no money to do the job properly. Power was supplied from a pole-transformer dropping the 11,000 volts to 240 and with these the neutral is always earthed at the pole. After checking all the legal stuff it was decided to use PME (Protective Multiple Earthing) A heavy duty wire link was connected between the Neutral and the Protective Conductor (AKA "Earth") on the fuse-board where the power entered the building. Result no more electric shocks! I did that "bodge" about thirty years ago and its still working fine. Sadly the widow passed away long ago. She died of old age not electrocution. IMHO those voltage operated GFCIs that date from the 1950s and 1960s ought to be banned. They probably are but people still use them. One old house that had its wiring fixed by a friend had a two wire (live and neutral but no earth) system where the wires were let into grooves in wooden conduits. A mouse had caused a short and blown a fuse. If the Electricity Board had seen the antique wiring they would have demanded a full re-wire which would have cost thousands! Take care! It depends what you want to protect. If you just want to protect that outlet then it's easy. Pigtail the Black and white wires and connect them to the feed side of the GFCI. Leave the load side of the GFCI disconnected. Where it gets tricky is if you want to also protect downstream outlets. Current that flows out through a GFCI must return through the same GFCI. Otherwise it will trip. So to protect both hots using GFCI outlets you would need two such outlets and you would need to keep the neutrals downstream of the GFCIs seperate which would likely require some rewiring. An alternative may be to use a double pole GFCI breaker at the panel. Another alternative is just to install a seperate GFCI at each outlet. 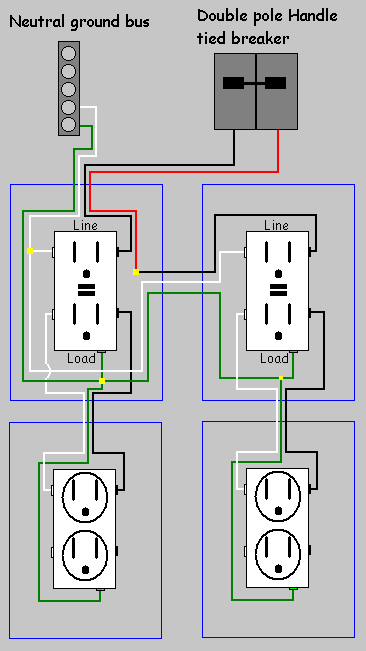 This "shared neutral" circuit is actually one circuit called a Multi-Wire Branch Circuit or MWBC. You must comply with their rules. Rule: You must pigtail neutrals. You can't use the 2 neutral screws to daisychain through the receptacle as you illustrated. The two "hots" that share the neutral must be landed on a 2-pole breaker. This 2-pole breaker assures common maintenance shutoff (an MWBC rule) and that the hots are on opposite 120V poles (a very absolute MWBC rule). As it happens, they make 2-pole GFCI+breakers, which accept 2 hots and a neutral. And that's what your cable is. You fit the 2-pole GFCI breaker, attach its neutral pigtail, and bring all 3 wires: both hots and neutral to the GFCI breaker. And you're done. This will fully protect any legal configuration of MWBC/shared neutral circuit. You don't have to worry about how neutral is shared and firewalling line from load. It just works. "Oh, but 2-pole GFCI breakers are expensive" -- so are four GFCI+receptacles, as you show in the drawing in your edit. If you absolutely insist on using GFCI+receptacle devices, well.... okay. You can do as in your last drawing (in your edit). This makes it a very simple rule: Don't remove the warning tape from the LOAD terminals. Simple as that. Of course, you'll be sitting there tempted, right? 2 wires in your hand and 2 screws you can't use--- nuh uh don't touch that tape! You have to figure it out another way. Hands off! This will lead you to a concept called pigtailing, which I remind you, you need to do with the neutrals anyway because of MWBC rules. So, now you're doing it with the hots too. Pigtail every connection onto the LINE hot and neutral, and voila. You have GFCI protection everywhere you choose to fit a GFCI+receptacle. And it didn't explode your brain. Dont over complicate this. It is very simple problem. Just leave the red wire alone. No one here knows for sure what it is used for but it doesnt matter. Every electrician/homeowners wire things a little different. It could be right or wrong but if everything works dont worry about it. Without using the red wire you can use the diagram you provided. The only thing to figure out is what wires is the hot feed. The easiest way to find this out is to turn off the breaker and disconnect one set of black and wire wires. Then put a separate wire nut on each and turn the breaker back on. if the outlet still works then the wires connected are hot. If not then obviously the wires you took off and capped are. Now you have to decide if you want the rest of the outlets on this series to be protected by the GFI and connect your load wires up accordingly. It will be label on the back of the gfi which load connection point is protected. BMitch's post is partly correct and dangerously wrong. 3 wire circuits of (2) 120V circuits sharing one neutral should be connected to lines with a 2-pole breaker, and MUST be on opposite phase (even/odd circuit breaker positions, 240V across breakers). Shared neutral carries unbalanced load such that 15 amps on one circuit, 5 amps on the other, results in 10 amp neutral current. 15 amps on each opposite phase circuit balance, cancelling neutral current to zero (0) amps. Sharing neutral on 2 same phase circuits (even/even - odd/odd circuit positions, 120 V across breakers) should NOT be done as it results in additive neutral current where 15 amps on each circuit result in 30 amps on neutral, dangerously overloading conductor. Adjacent single pole breakers should not be used, and skipping panel spaces for even/opposite circuit positions, should NOT be done - for safety reasons where turning one breaker off to work on a circuit can result in dangerous condition if shared neutral splice is opened, being energized via the shared circuit. Both circuits must be OFF. Pigtail the neutral and the hot. This is the correct way to install any receptacle, GFCI or not. white carries unused power back. Black n Red carry power in (to power your crap) But be careful ( if black wire is attached to a breaker at the electrical panel that is labeled an even number and the Red is attached to an odd number (hard to notice stamped numbering on cover beside breakers) Odd to odd OK Odd to even Not ok = 240 boom! So if Black X and red Y then proceed with: black to Line holes on gfi (crap hooked up to Load) Red wire dont hook up, twist together to pass to next location. Next location hook red to LINE on gfi and dont connect black. just don't land black and red on same location, red gfi = microwave black gfi = fridge red gfi = blender black gfi = coffee maker White wire should go directly to each gfi without detour. don't use white from load or line off gfi but twist a bunch so 1 white hits black gfi 1 one white hits red gfi 2, back gfi 2, red gfi 2 ....etc. you can share the white wire coming from any receptacle with the same color as long as the same colored wire and it's brother white wire are hooked up to a known even or odd label (stamped next to breakers) odd to even cross 120+120=240 even to even 120+120=0 since its the same Phase (odds are phase 1 separated from power on phase 2 evens) odds are all virtually the same 120 evens are virtually common with each other at 120. red and black make 240, red and red make 120 did i miss anything? Not the answer you're looking for? Browse other questions tagged electrical gfci or ask your own question. How can I add a GFCI breaker on two circuits with a shared neutral without rewiring? How do I install GFCI on multi wire branch cicuit? Can I take a 220 line and convert it to a regular house outlet what would be the damage? How do I replace two split receptacles with GFCI receptacles? How do I wire a GFCI with 5 wires? Can I connect only two wires to GFCI receptacle?